I’m a huge fan of SketchUp for a long list of reasons. At the top of that list is that it helps me to quickly workout some ideas for projects I’m about to build or ones I’m trying to decide if I want to build. The other day I received an email from the SketchUp folks (I’m signed up for their newsletter, just like you can be too) and it included a cool video they shot to promote the software. You can’t miss that it’s a promotional piece, but after seeing Chris Connor of Connor Wood Bicycles shaping the frames of his wooden bikes and talking about his love for woodworking, I felt I had to share it with the people who would appreciate it most! “We visited Connor Wood Bicycles (www.connorcycles.com) to see how SketchUp has helped Chris Connor create rolling works of functional art. 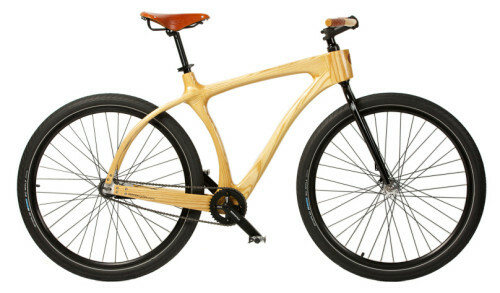 These sustainably built ash and walnut bicycles are individually hand-sculpted to create a fusion of nature and cycling. We hope hearing more about Chris’s passion will inspire you to create something you love. I am an avid cyclist and wood worker. I had actually been considering building one out of Bamboo.